Title text: I like to think that somewhere out there, there's someone whose personal quest is lobbying TV providers to add an option to switch their on-screen keyboards to Dvorak. What puzzles me about my parents' TV is that the number keys on the remote have letters on them the same way phones used to, so they could've just used that for text input. It would even be faster, since we'd just have to re-learn an old skill instead of adopting a new one. I use T9Word on my DirecTV remote. It's only been a couple months since I got a TV with a browser so that I could find out the utter joy described by this comic. Our DirecTV remote is configured the same way, with letters under each of the digits. But if we want to search for programming we have to navigate a matrix of letters (with a special "space" character) using the arrow keys to enter text. I have to say at least their autocomplete is fairly smart. But yeah, it makes me feel like I'm interacting with an old Atari game console. I second Randall's rant ... except for the Dvorak keyboard part. When *I* was a boy... We had a huge 27" screen Zenith console TV, with a "space command" remote. You cold turn the channel, or volume up/down.... and watch the actual dial on the TV across the room turn, to a "ka-chunk, ka-chink, ka-chunk" sound, to get to one of the four channels. Keyman wrote: When *I* was a boy... We had a huge 27" screen Zenith console TV, with a "space command" remote. You cold turn the channel, or volume up/down.... and watch the actual dial on the TV across the room turn, to a "ka-chunk, ka-chink, ka-chunk" sound, to get to one of the four channels. You had FOUR channels, we had one for certain and two if no one on the street had an electric motor running. Power tools played havoc but refrigerators would interfere too. Our remote was the youngest person, sadly that was me. You had channels? We had to listen to the radio and try to draw each image frame on a stack of paper as the description came through. Back to semi-serious stuff -- remember those gigantic "universal remotes" that had a touch screen and about 35 levels of menus? Somewhere in there was a touchscreen keyboard, but this was way before cable on-demand (or streaming internet) was a thing. Modern consoles still have this horrible text entry method. Makes me never want to change my password for anything they can access (wifi, Netflix, Pandora, etc). For more fun and yelling, use the Xbox Kinect method of waving your hands near the wrong letters for just long enough to select them while trying to get the avatar to get closer to the letter next to it. We didn't have a remote control or color until the mid1970s. But we had an antenna rotator and we lived at the top of the ridge known as the Niagara Escarpment. To a first approximation, it was downhill from our house all of the way to lake Erie. Canadians built the CN Tower so tall that we could watch Star Trek reruns with Canadian ads. In addition to Toronto stations, we could get TV from Buffalo, Niagara Falls, elsewhere in New York, Pennsylvania, Ohio, and sometimes even from Windsor Ontario, which is way at the other end of Lake Erie. We could watch dozens of stations in 1972! We had a wired remote control for the antenna rotator. It lived on top of the TV set. We had to physically walk to the TV to aim the antenna and change the channel. I knew that the guys on Star Trek that died just to show how the monster worked were called "red shirts", but they were all grey to us. This is why (certainly not any self-proclaimed brilliance) I used to put myself as "ACE" on Space Invaders machines. FIRE, right, right, FIRE, right, right, FIRE. There were other 'easy' patterns, that meant something, but that tended to be the one coming most trippingly from my battle-hardened hands. Do you think things are bad here? I am Lord Titanius Englesmith, Fancyman of Cornwood. See 1 Kings 7:23 for pi. If you put a prune in a juicer, what would you get? Unfortunately we no longer have Sky, so it's just gathering dust whilst we type things in one by one if we want to watch youtube or iPlayer or what have you. What bugs me is when these on-screen keyboards, that you have to select with arrow keys moving a cursor, have the keyboard in a QWERTY layout. Besides just being harder to find the letters, by the very nature of QWERTY means you have to move the cursor further to type words. We had SIX channels! Though that was because we lived halfway between East Middle-of-Nowhere and West Middle-of-Nowhere, so we got the PBS and CBS affiliates from both places. West M-o-N didn't have NBC or ABC. 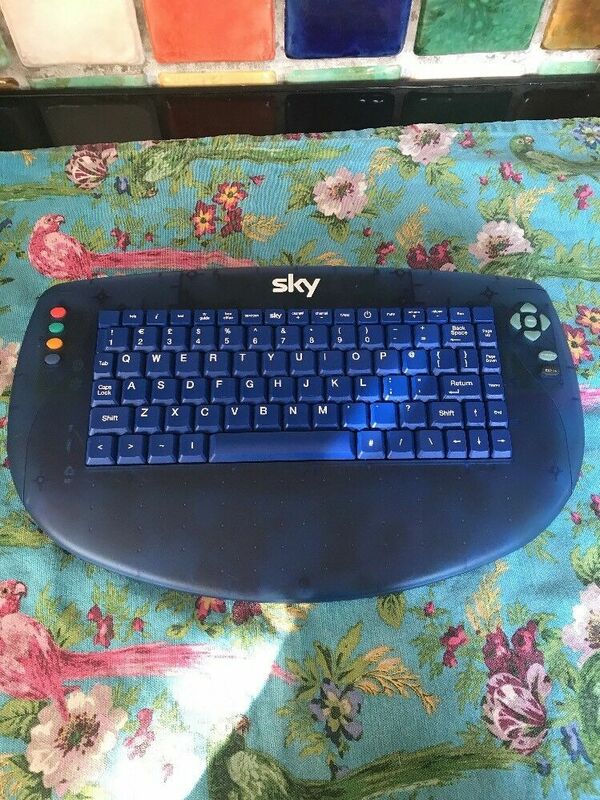 Showsni wrote: We have an awesome Sky remote keyboard, that is a remote controller with a full keyboard on it. Or a keyboard with a remote control built in. mschmitt wrote: Besides just being harder to find the letters, by the very nature of QWERTY means you have to move the cursor further to type words. 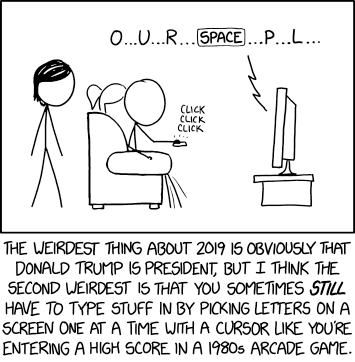 If you've got no knowledge at all of QWERTY, maybe, but (except for dedicated Dvorak/other users) I very much doubt you can be entirely flummoxed by the layout, in today's world. (And in an alphabetical grid, is G top right or next row left, or middlish? Depends upon the grid decided upon. Maybe it's a rotating pin-wheel or other looping Fruit Machine interface, but is it quicker to spin from A to R forwards, or going backwards, maybe through the numeric characters and punctuation?) QWERTY is a standard you can get used to, whatever its failings (which are not the ones it is famous for having), rather than a proprietary choice made on the spot, that probably matches no-one else's on-the-spot design layout. And I bet you get more need to cursor with ABCDEFGHI JKLMNOPQR STUVWXYZ0 123456789 (or whatever set of rows you decide upon that needs to feature alphanumeric sorting - kept simple here by omitting punctuation and symbols and case-shifting 'keys') in typical usage than a similar four rows of QWERTY-adhering. That's with a similar outlier of the A in both. Could it be better-ordered? Probably. But not alphabetically. anian wrote: For more fun and yelling, use the Xbox Kinect method of waving your hands near the wrong letters for just long enough to select them while trying to get the avatar to get closer to the letter next to it. I need to grab a spare keyboard and see if it can work in the TV's USB port. I am prepared to be disappointed in the letters only working only in places where you don't need to type much, but maybe I can at least use the arrow keys? Similarly disappointing is with our "Smart" TV which can be controlled using an app on our phone, which said app even has a button which brings up an input box and the phone's keyboard presumably to allow entering the text using the phone's keyboard does nothing. Perhaps there's something more I need to do or it only works in select circumstances or something, but each time I'd tried using that feature it hasn't done anything except neatly display the stuff I've typed in the little input box on the phone with nothing happening on the TV. Of course that only applies to when I'm using the TV's built-in "Smart" interface. When I just switch to the computer I have access to the full keyboard and mouse as well as input using the kdeconnect app on my phone which does work exactly as I'd expect for both touchpad and phone-based-keyboard input. SuicideJunkie wrote: I need to grab a spare keyboard and see if it can work in the TV's USB port. Prepare for the disappointment that it only supports storage devices. And only the first partition. And only images and MP4 files. The whole problem begins with the idea that for some reason you should be able to input some written text into a television. You have gone too far. I would probably find that less disappointing, honestly; at least in that case, nobody spent time working on keyboard support. On the other hand, if it does recognize the keyboard, but can only use it to enter a wifi password, but not for commonly used text entry fields like a search screen... that would really annoy me. It means somebody tried, but epicly failed at what has been a basic task since the early 80s PCs. And the television is just a tabletop computer built into a stupendously large monitor these days. The storage thing would be similar I suppose, although I don't really have a use case for that, so I won't feel the pain. Anyone else remember the radial input mode Steam tried pushing? You'd push the left stick in one of eight directions and then press a face button, for a total of 32 available characters. I found it to be surprisingly quick and intuitive because the groups of letters were arranged alphabetically, clockwise from the top. At some point they relegated it to a non-default option and broke support for it in Steam Input. airdrik wrote: Similarly disappointing is with our "Smart" TV which can be controlled using an app on our phone, which said app even has a button which brings up an input box and the phone's keyboard presumably to allow entering the text using the phone's keyboard does nothing. Perhaps there's something more I need to do or it only works in select circumstances or something, but each time I'd tried using that feature it hasn't done anything except neatly display the stuff I've typed in the little input box on the phone with nothing happening on the TV. ^ good point. Technology is great... but it's gotta work and it's controlling a permanent appliance in your home it has to work every single time for the life of the product! I'll take an old-school analog, 100% compatible, dependable remote with clumsy text entry interface, over a slick new app that has any chance of not working correctly. I wouldn't mind having both options though with the dependable remote as a fall back plan. I will say, I appreciate that many streaming companies have good algorithms to give suggestions/guess at what you're painstakingly typing into the searches. I even appreciate how Netflix suggestions includes movies/shows they don't have available, so you don't have to keep searching in vain. You haven't given up, have you? There's still a chance Hillary can win the 2016 election. They might find some uncounted ballots or something. It's used to search for show titles. Only valid letters are highlighted/used. Say there are no titles beginning with "Ag", but there are titles starting with "Am". Entering "A" as the first letter will cause the G to be grayed out. Pressing down once from A will go directly to M.
To the right of the text entry field is a list of all the shows starting with the letters entered so far. Once you've entered enough letters that the show you want is on the top of the list, you go right past the FLRX40 column and press enter. It looks pretty old fashioned, with big block letters and maybe 4 colors total. But, I don't know how you could do it any better without adding 26 buttons to the remote. I used it all the time back in the Palm days. I was as fast on that as I am on my keyboard. Never really got ported to smartphones however. What happens if there are titles beginning "An", but no "Ab", "Ah", "Am", "Ao", "Ap", "Aq", "Ar", "At", "Az", or "A6"? How would you then navigate to 'N'? rmsgrey wrote: What happens if there are titles beginning "An", but no "Ab", "Ah", "Am", "Ao", "Ap", "Aq", "Ar", "At", "Az", or "A6"? How would you then navigate to 'N'? I suspect a cursoring would take you to a standardised* adjacent row/column (as well as the cursor-direction new column/row) that would accept your input. Try it in Windows. Array a virgin folder in "large icons" mode with files A.. Z or so via "New… .Text file" or your own favourite version of this. Disable auto-arrange (if necessary) and enable snap-to-grid (if required) and delete (or temporarily move to a holding folder/window, to save recreation later) various co-orthogonal files to the chosen file icon with current focus upon it, and use the cursors to transit in 'impossible' directions. Rinse and repeat with varied starting points and plausible-or-otherwise destinations in each cursored direction. Should be testable in (GUI) Linux and Mac environments, too (and bare X11, OS/Warp, BeOS, Amiga's 'Intuition', etc, probably) with maybe different 'solutions', but at least self-standard if not deliberately made equal to whatever grand-pappy of GUIs that flavour has inherited this behaviour from. * rather than shifting either left or right, or either up or down, by random choice, always the same one of two equally near side-steps or the single nearest if a differing number of columns/rows are barren beyond the single barren orthogonal. For the next possible step in that orthogonal cursor direction. I actually misread the problem, fair dinkum. Though it's a likely edge-condition, and if m/A[BHMOPQRTZ6]/i is unmatchable, likely other /A\w/ combos also are, thus allowing a 'drift' onto N.
But that's what extensive testing is for, to identify all exceptions that need to be handled. And nobody skimps on that so no problems, right? My remote/cable box combination has voice recognition, so I can peform searches for shows that way. Sadly, it doesn't work with either the internet browser or the Youtube app. By the way, Dvorak would be a *horrible* choice for keyboard layout for console style text entry since it's optimized so that the hands alternate letters as much as possible, meaning all the common consonants are one side of the keyboard and all the vowels are on the other. However, there are two lesser known Dvorak formats, optimized for one hand typing, one for left hand and one for right. I think these were designed with handicaped people in mind, but they would work very nicely with cursor style entry too. Now cursor is "on" N, and Na, Ne, Ni, No, Nu, and Ny are available. User wants Nu, so arrows down. Cursor goes down to T, which is unavailable, and automatically shifts over to U, which is. Now, is the cursor "on" U, or is it "on" T but "just visiting" U? I'd vote the former, mainly because that's what we are seeing on the display. Nun and Nuo are available, among others. If we arrow-up and the cursor is "on" U, we reach O. But if the cursor is "just visiting", we'd reach N.
(Linux) gedit text editor has this "just visiting" behavior when a line is the "wrong" length for arrowing up or down. The system remembers what column the cursor is "supposed to be in", and jumps to that column whenever possible. Although it's annoying, the opposite behavior would also be annoying, just in the other way.